Rebecca Black said putting caused her and many others problems at the Greensboro Invitational. Photo by Charles Heard. 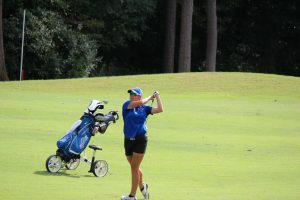 The Bulldogs’ athletic family grew this year with the addition of a women’s golf program comprised of freshmen recruits. Only one player, Janie Thomas, is from North Carolina, the others hailing from Florida, Ohio, Pennsylvania, Kentucky and Iowa. The Bulldogs played their second tournament of the inaugural season Oct. 3 to 4 at the Starmount Forest Fall Classic in Greensboro. The Bulldogs placed ninth out of 11 teams in the tournament. 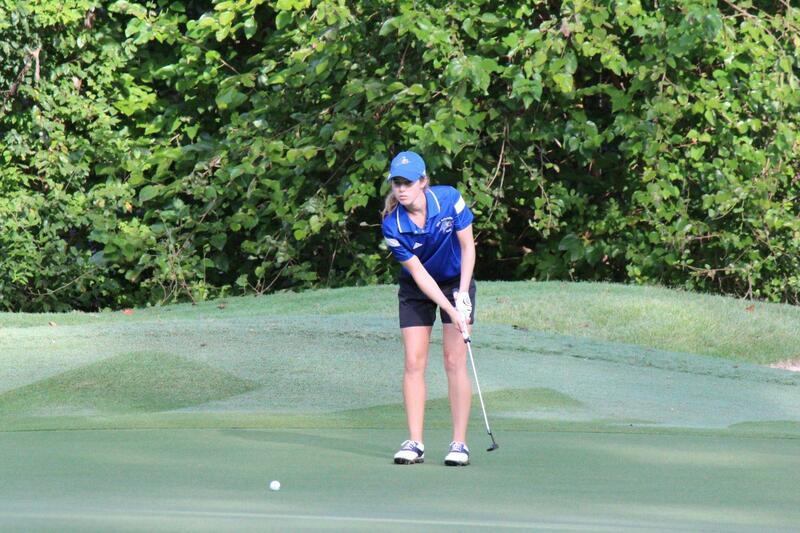 Bulldogs Rebecca Black and Erica Oldberding all cited their putting as the biggest hinderance to their game. Thomas, an 18-year-old freshman, said she didn’t perform as well as she could have due to a lack of assurance in game. Coach Hall said the Bulldogs have clearly been the youngest group at both tournaments this year. Thomas and Black said their older opponents have a slight advantage, but playing older opponents is nothing new. “The upperclassmen we play are definitely more mature and stronger,” Thomas said. Black, an 18-year-old biology student, said playing older opponents isn’t entirely new because of their experience in junior tournaments. To Olberding, the skill of opposing players is not a factor in her game. Erica Oldberding follows through on her swing at the Greensboro Invitational. Photo by Charles Heard. Black said once the team gains more experience, she too, is confident they have the talent to place higher in tournaments. Hall said the team is taking steps to catch up with its more experienced opponents. Olberding said Asheville does not share much in common with her home state Iowa, but she is looking forward to growing as a player here. Coach Hall has been involved with the Professional Golfers’ Association for 11 years and was once the pro at the Grove Park Inn. This is Hall’s first season of collegiate coaching. She said one of the reason’s she is happy to be working with students is their desire to improve and their willingness to learn.